OXFORD, Miss. 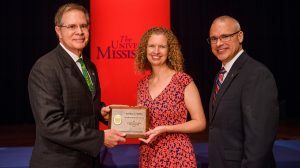 – For the second consecutive year, a pharmacy professor has won the University of Mississippi’s Faculty Achievement Award. Interim Provost Noel Wilkin commended Willett’s “impeccable and professional profile as a veteran scholar, researcher and educator,” when presenting her with the honor. “She possesses a unique capacity to connect with students and meet them where they are in their learning journeys,” Wilkin said. Willett, who joined the Ole Miss faculty as an assistant professor of pharmacology in 2000, was named department chair earlier this year. In the past three years, she was chosen as the 2016 UM Sally McDonnell Barksdale Honors College Faculty Member of the Year, was selected for a three-year term as a School of Pharmacy Distinguished Teaching Scholar and won the pharmacy school’s 2016-17 Faculty Instructional Innovation Award. “Kristie’s philosophy of teaching is honest, thoughtful and practical,” said David D. Allen, the school’s dean. “It reveals the spirit of a true educator and mentor. Willett has also been the graduate coordinator of the environmental toxicology graduate program since it began and teaches two of the core courses in the department’s environmental toxicology division. Allen also commended Willett’s collaborative research mindset, citing her creation of the school’s thriving environmental toxicology research program, despite being the only faculty member with a background in such research. Willett’s environmental toxicology research focuses on human diseases. “As an environmental toxicologist myself, I am really committed to educating the next generation of toxicologists,” Willett said. Several of Willett’s students said her positive attitude and dedication were vital to their academic success. Environmental toxicology doctoral candidate Dennis Carty credits her with teaching him to become a more independent and creative researcher. Willett makes the 12th Faculty Achievement Award winner with a full or joint appointment in the School of Pharmacy since the award was established in 1986. “When you truly like what you do, it is easier to do it well,” Willett said. “Science is a tricky profession that comes with lots of rejections and experiments that don’t always work like you thought they would, so it takes a lot of persistence.